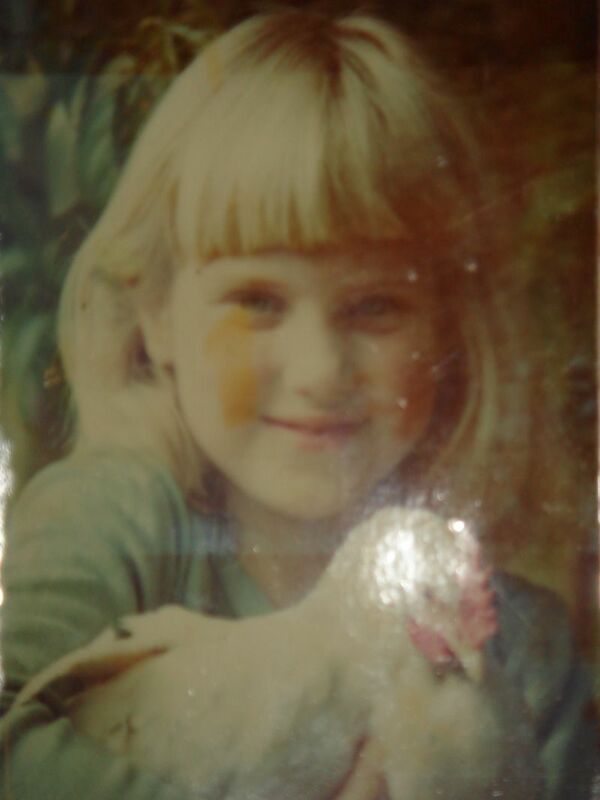 Our farm manager, Charles, phoned me at 5:45pm to say that the chickens had come in to roost, and one was missing. Getting out there now, would have meant arriving in the dark which would have been useless. Charles searched until it was dark, but he could not find her. I feel sick with worry. I will leave at 4:30am tomorrow morning to get there as sun coming up. We can all search for her again. Will also be able to identify which one is missing. Charlessaid it is one of the dark brown hens. This is either Henriette or Cindy. Either she has been eaten by something in the veld, stolen, died of a natural causes, or injured. I don’t love the thought of any of those options, however, her being stolen, is the most worrying. 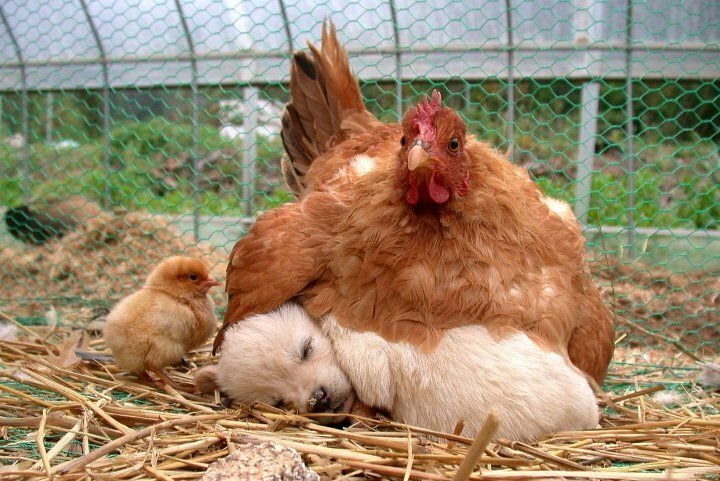 One of our chickens hatches puppy ....ok, not really, but plse read our blog, and find out what we do. Got sent this pic via e-mail. Not sure who to attribute it to. 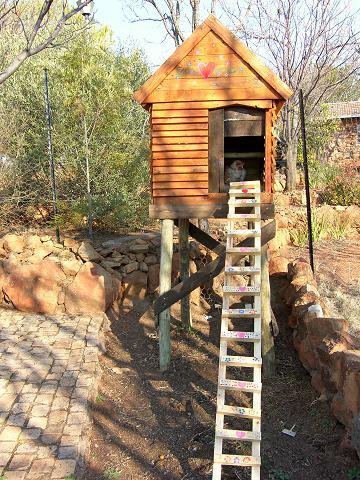 The three girls rescued last weekend from Zandspruit (See posting from 23rd March 2010) went to their new home yesterday. They were fetched by Fiona’s parents. Again, as with Ralf, I felt very relieved and grateful that they seemed to be going to such a nice home. I am really excited to hear an update from Fiona today, on their first day and night with her – and what their names are. We specifically did not name them, so that our emotional attachment was less. 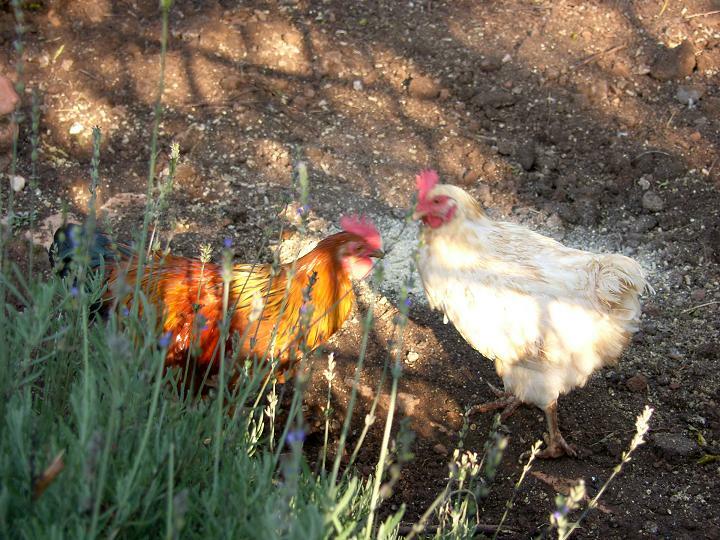 Amber and Galhinia, our resident chickenoids (chickens who believe they are human) were relatively gracious about opening up their garden to three new chickens for the week. Was approached by someone yesterday for another 2 rescues. 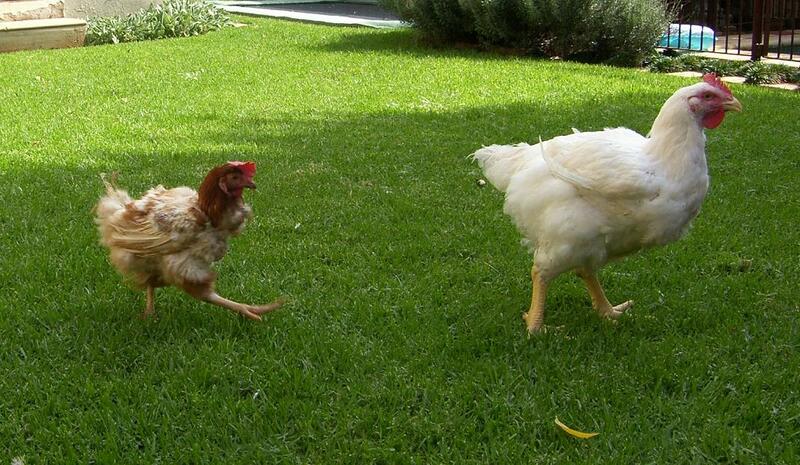 Maybe, just maybe, she will take 3 hens instead of 2. Having expressed relief at Bella being so much better in the blog last week, she started her open mouth breathing again on Friday afternoon. Jean and I put her straight back onto intra muscular anti bio injections. So, I have been practising my amateur injections again on poor Bella. I am getting more skilled. Bella has now been on anti bios for a total of 5 weeks . I am aware that this is not good for her, but we don’t seem to be able to stop without her re gressing. I think her body is just too compromised to help fight this. I monitor Bella each day. At present I do think she is getting a relatively good quality of life, so we continue. Still adding good quantities of pro biotics and brewers yeast to her diet. Maybe a consultation with homeopathic vet? All doing well. Petrus settling in nicely. Look forward to seeing them all next weekend. 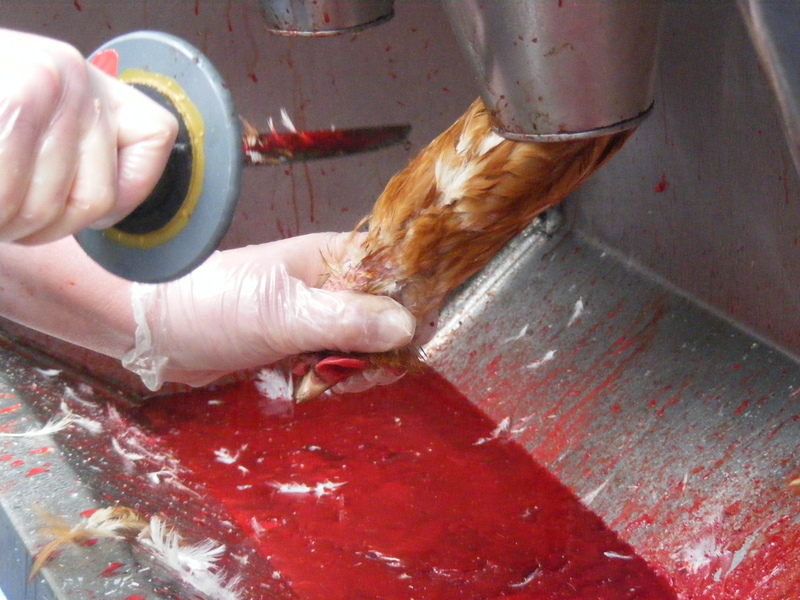 Mechanised Chicken slaughter. 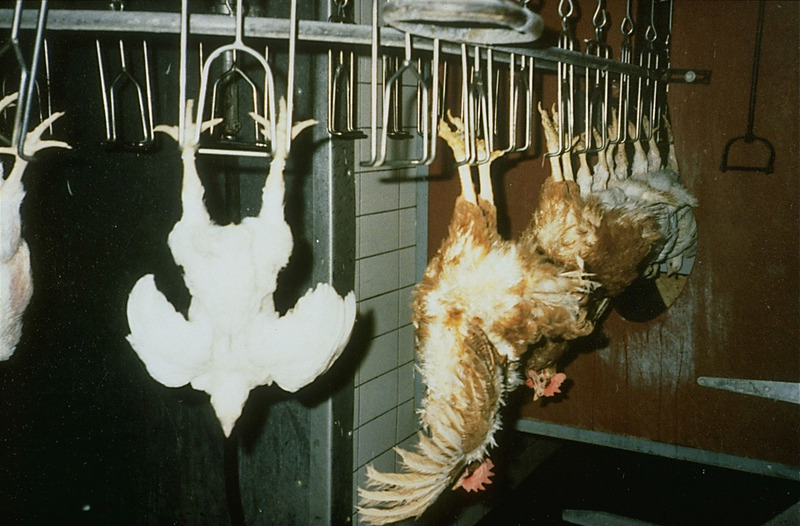 Chickens are placed upside down in shackles. Shackles are painful and their legs get broken and damaged. 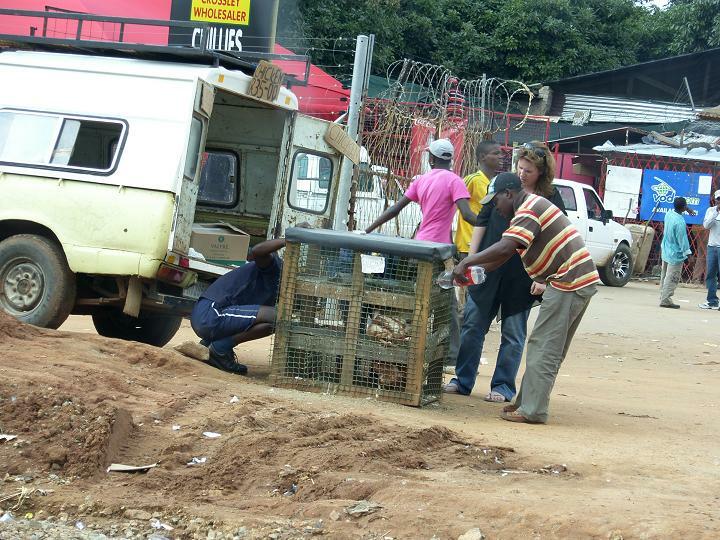 These chickens have endured the trauma and rough handling of transportation to the abbatoir. 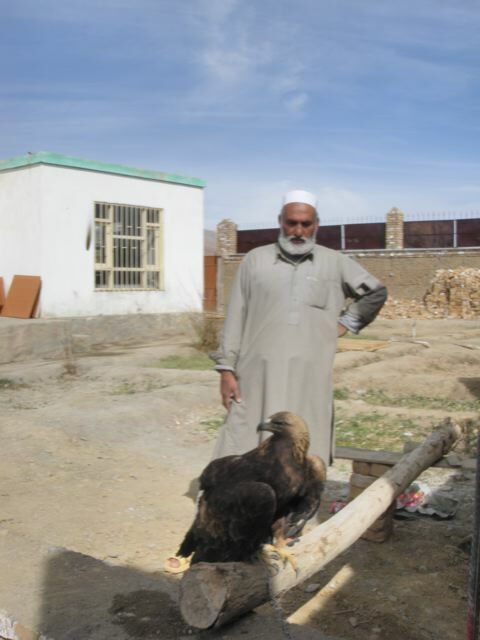 They have not has food or water for a day or two. They will now have their throats slit. I often wonder who devised this 'effective' means of slughter? Do you think he/she is proud of their work? 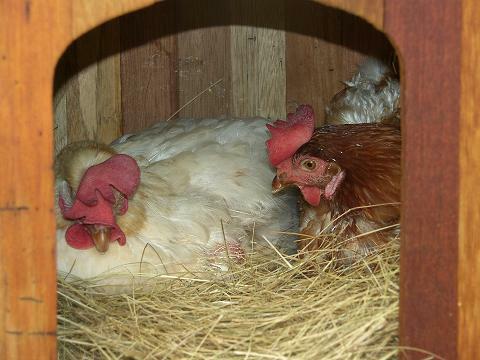 Amber and Galhinia lay morning eggs together. Note substantially more feathers on Galhinia than picture before. Galhinia has been with us now for 4 months. Is it worth all this pain and suffering? 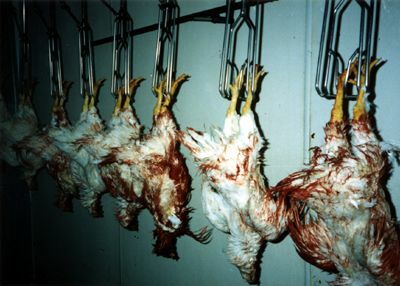 Do you want to continue to support an industry that inflicts mass torture daily? 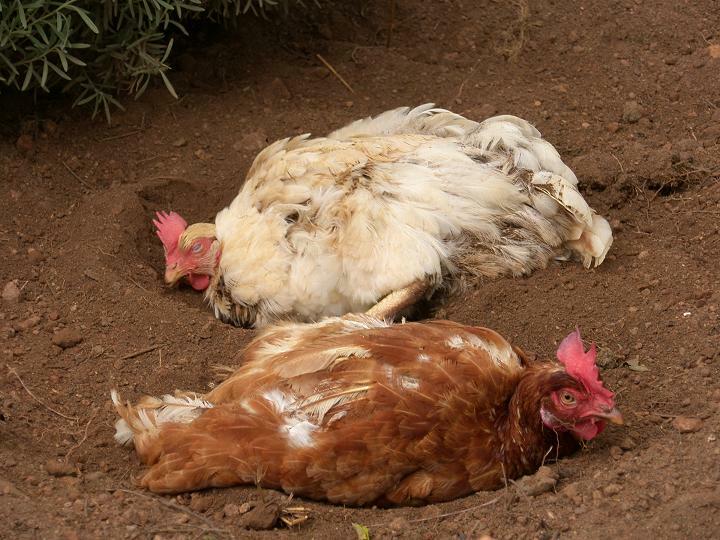 Chickens love dust bathing. 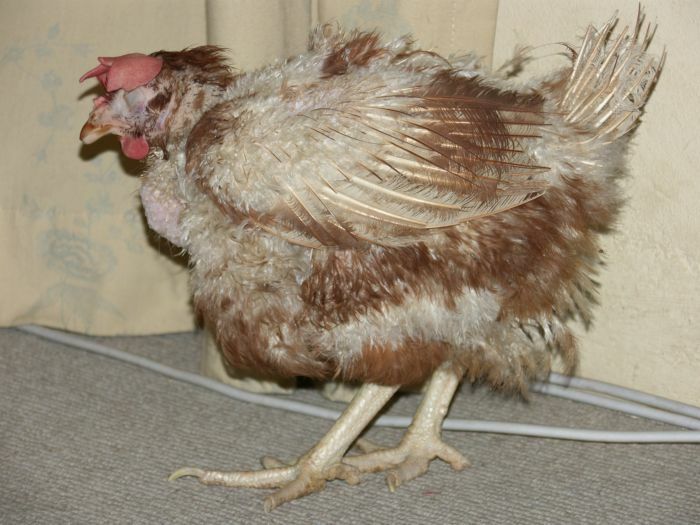 It takes extra oil off their feathers and keeps them clean and lice free. 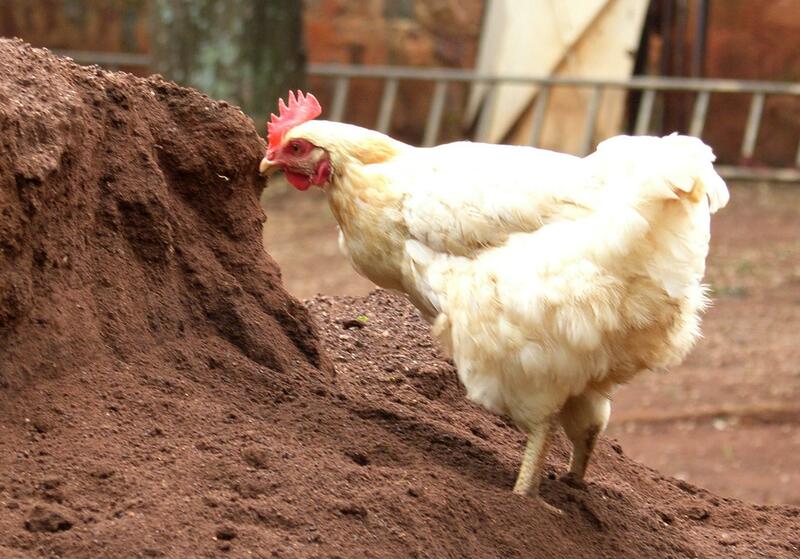 Here Henriette and Melody have a dust bath. 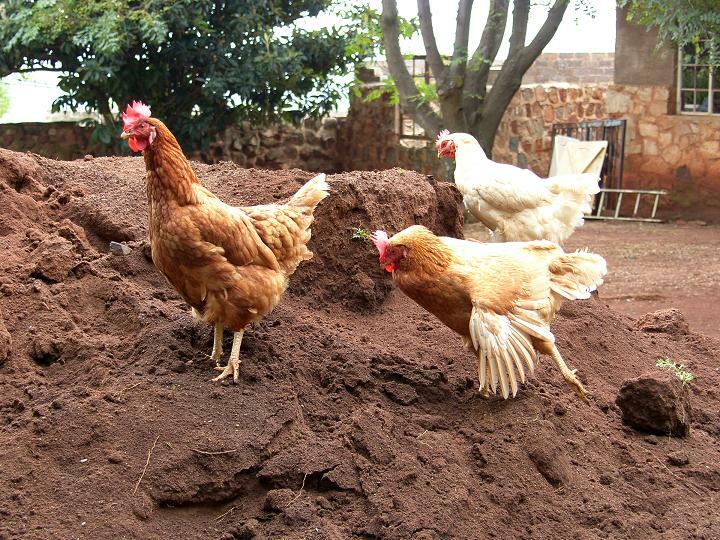 I love watching chcikens dust bath, especially our new chickens who i know have never been afforded this opportunity before. 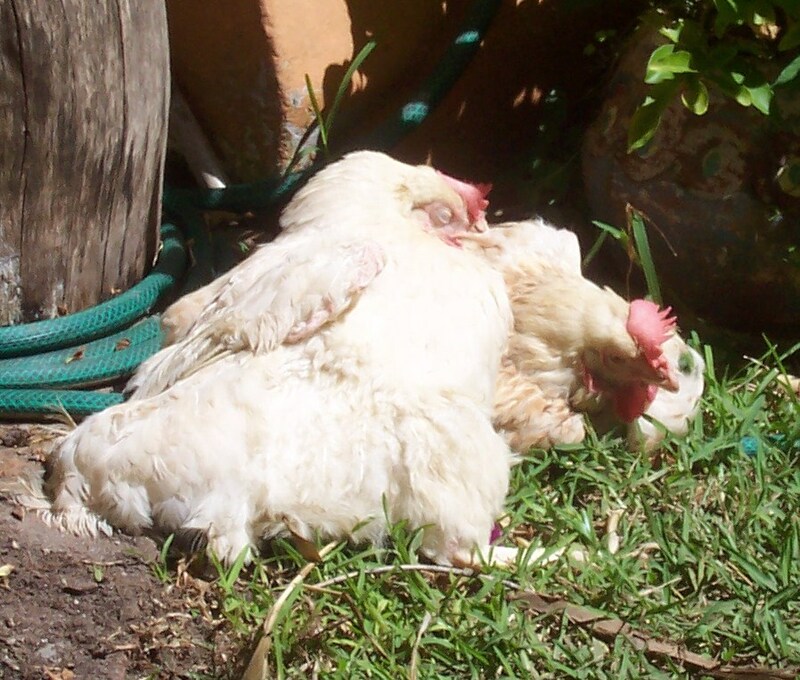 Their joy when dust bathing is so apparent. Cone slaughtering. Chickens placed upside down in a cone. Their heads are pulled through the openeing at the bottom of the cone, and their heads are cut off. 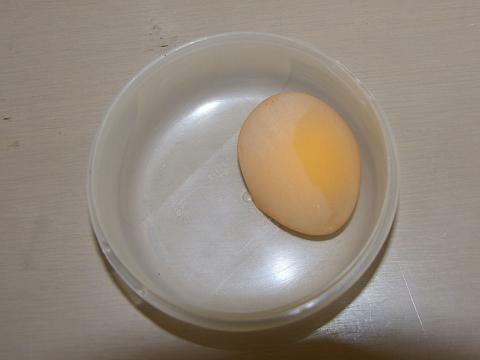 An egg with only a membrane and no shell. 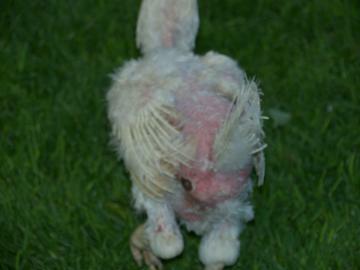 Many of our hens come calcium deficient from poor diet and excessive egg laying. 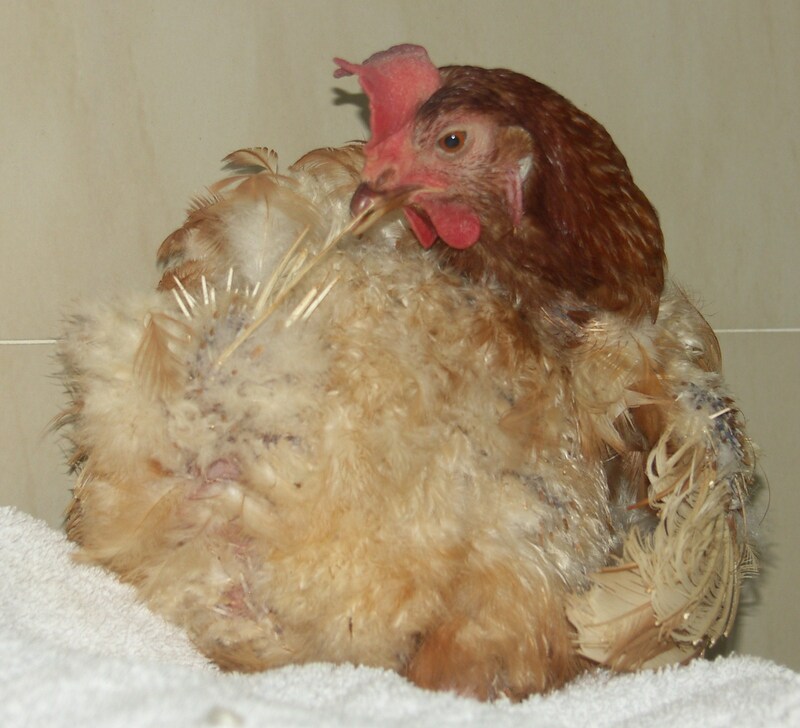 Infections in their egg duct can also cause a lack of shell to develop. 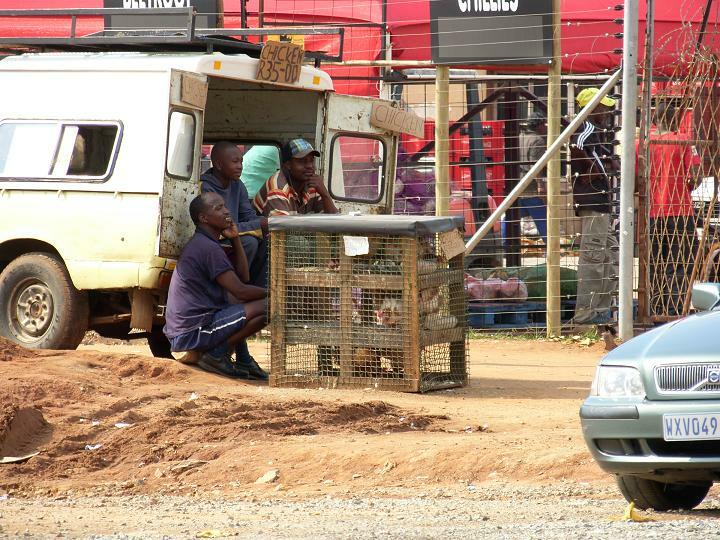 Begging, pleading, preaching, cajoling, asking sellers to give water to the chickens. Food is out of the question as it is expensive. This particular seller was open to giving water. Whether he had an eye on pleasing me for future sales and was indulging me in the momemt, who knows. If we are to kill animals, let us not make them long for death before we do it. This week has been busy with chickens. Bella is still with us at 18 weeks, and seems to be going strong. Her mycoplasmosis seems to have cleared. I keep a watchful eye on the regularity of her breathing. I have moved her into my bathroom at night and out of the kids bathroom. Relieved to say I have heard no night coughing. I am tempted to do one last course of intra muscular anti bios – I would not like her to regress again. Her size is still noticeably impressive. 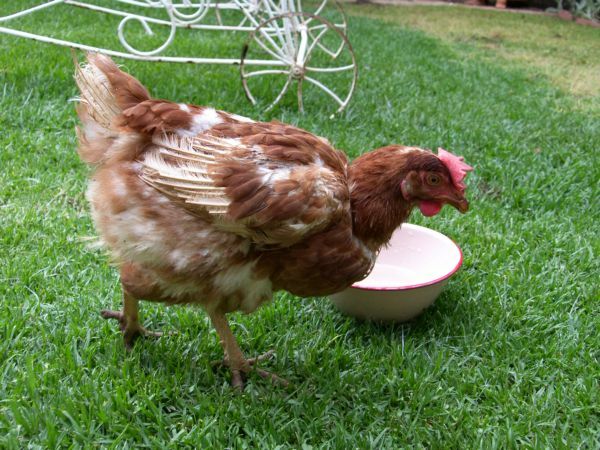 Tomorrow, Fiona (Kyalami home) comes to collect her 3 chicks. These girls have grown in confidence each day, and have even come into the house today. They are very reliant on eachother. If one happens to have a momentary individual thought and turns in the opposite direction and starts walking, the other two panic, rush around in 3 tight circles and re direct to follow the first. They are very sweet. I will miss them, but am also pleased that they have such a great home. Them leaving makes space for more rescue hens. Spent a great weekend with the farm chickens, photographing them, observing them, and delighting in both their freedom (knowing where they have come from), and their unique and amazing personalities. 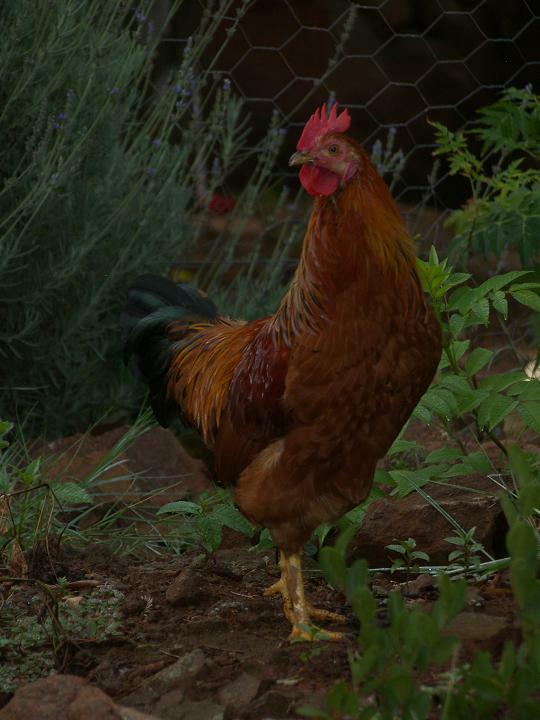 Petrus, the rooster, was introduced to the flock, and according to Charles (care giver and lover of chickens), Petrus is doing well. 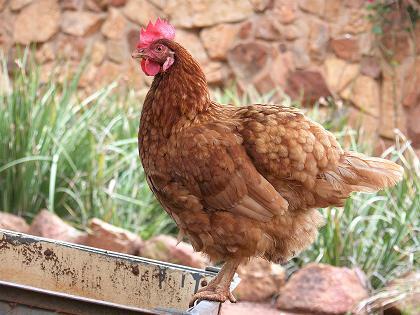 Here are some photos from the weekend for chicken lovers out there – and just to be a part of our joy – seeing these chickens with the freedom to do the things they most naturally do, in an environment that supports this. Petrus was given to us over the weekend by Ralf, a guy in Parkhurst who was given Petrus as a gift. Sadly Petrus’ love of greeting the morning is not making the neighbours happy. 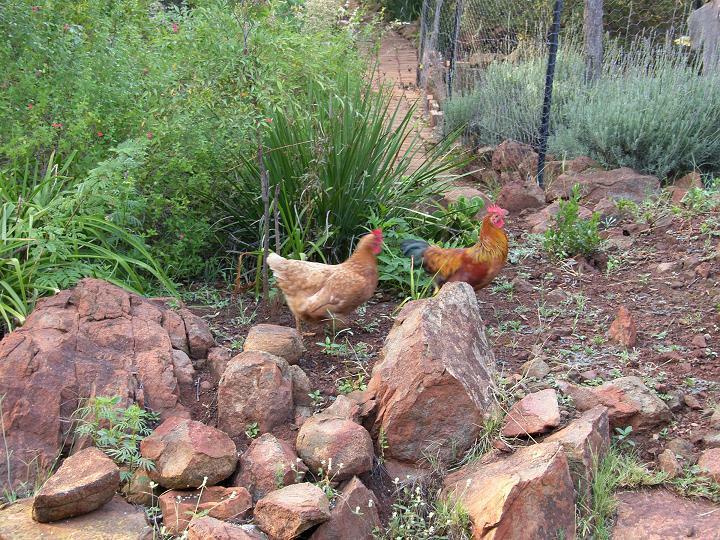 I have resisted having a rooster out at the farm, as I feel the girls have been through enough, and roosters can be a bit hectic. 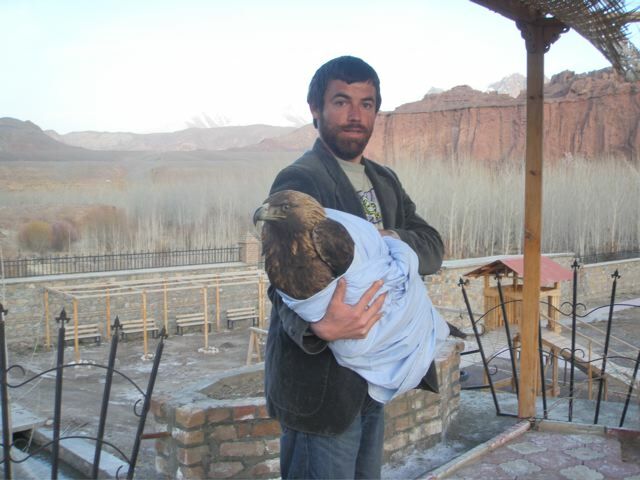 I am also reticent to allow our flock to have chicks and add to the millions of chickens already in the world. 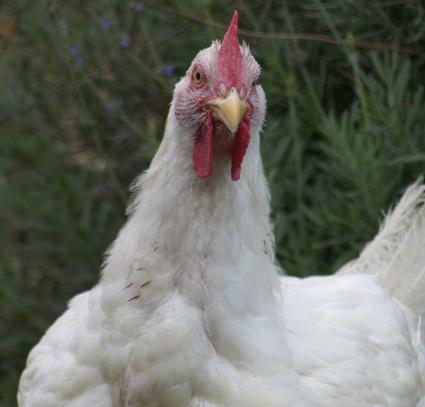 However, with the flock increasing, I thought we would give it a try, as Petrus needs a home, and roosters can also keep order and protect a flock. Petrus arrived on Sunday. Not only is he magnificent, but has a very gentle nature. It was love (from my side) at first sight. Petrus has come from a wonderful home, where he has been well cared for and loved. His companions were two ducks and a little hen. 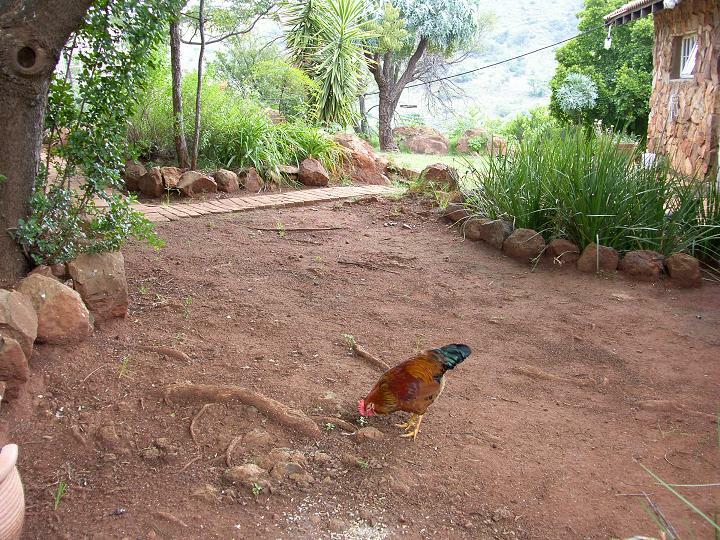 Ralf asked if we could rescue a hen for him as a companion to his current hen. Yeah! we are so happy to do that. Petrus had settled well at the farm, although our girls are setting clear boundaries with him, and spent much of the 2 days I was there with them, mock charging him. Petrus took it all in his stride, and they will settle. Yesterday we brought horse manure to the farm from a friends farm. 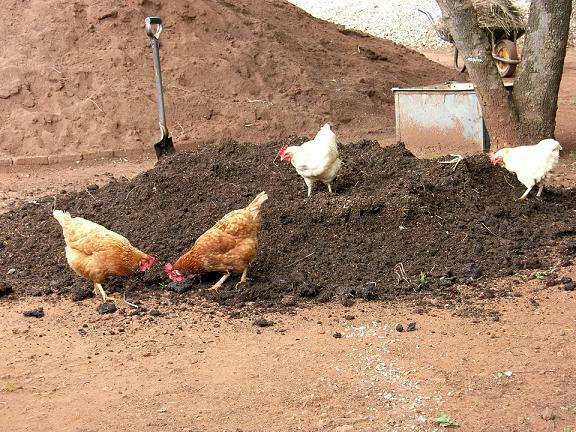 Petrus and the girls found some large cut worms in the manure. I think Petrus was terrified they were going to be taken away from him, so he grabbed a few, and ran away to hide as fast as he could. It was very amusing! 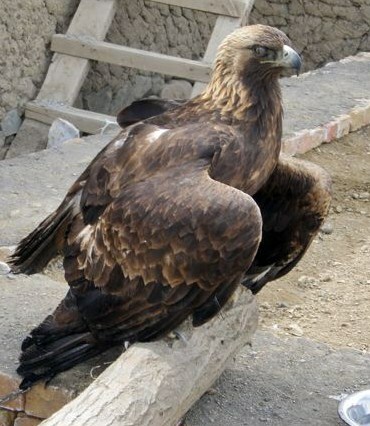 Yes, I know its not a chicken, but what is it? 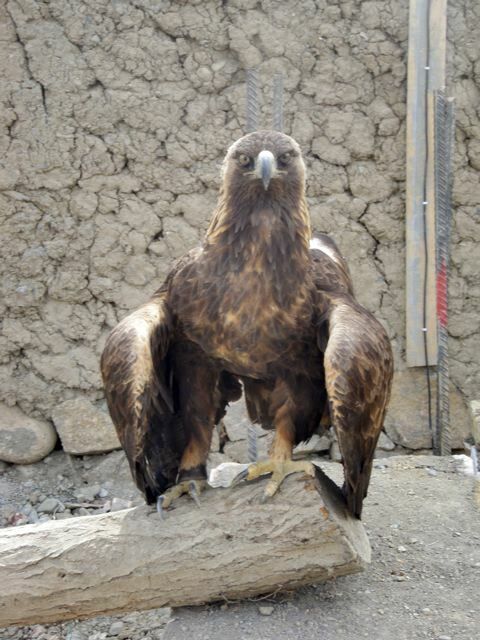 A good friend of mine lives in Kabul, Afghanistan. Yesterday she sent me these pics and the following text…. As of yesterday it was still to be identified, so if you know, let us know. 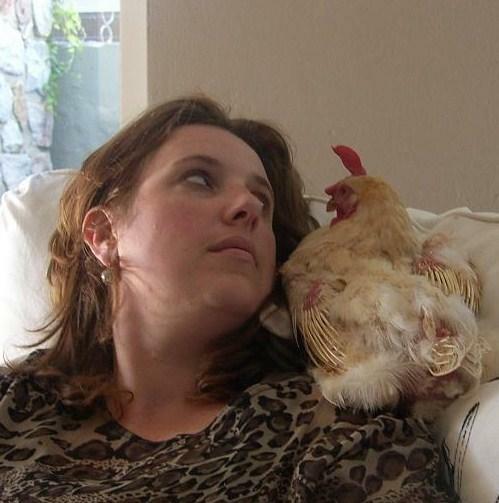 Getting ready for our 4 hen rescue this weekend. We’re coming sweat peas! Galhinia still not well yesterday. Back to Jean, where she had a very undignified internal examination. 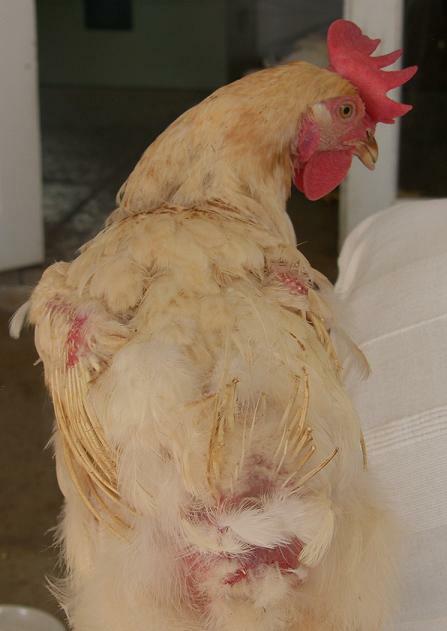 Galhins egg duct is inflamed. I have been noticing that shells of eggs are not as robust as have been, and that she has laid one or two membrane eggs (no shells). Galhinia is lacking in calcium, and is therefore battling to produce easy to lay eggs, which may have contributed to inflammation. Galhin had an anti inflam and is on calcium supplements. Apparently egg laying on the scale of what theses layers have been used to, vastly depletes calcium stores in their bodies. I think as a matter of course, I will start a calcium supplement with all our ex layers. Bella Ella is open mouth breathing again this morning. I give up (for the next hour anyway! ).